A "food" animal's perspective. The truth about "humane" farming. 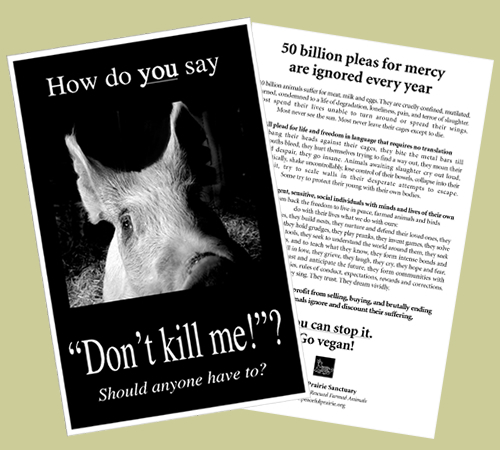 55 Billion animals suffer for meat, milk and eggs. They are cruelly confined, mutilated, burned, condemned to a life of degradation, loneliness, pain, and terror of slaughter. Most spend their lives unable to turn around or spread their wings. All plead for life and freedom in language that requires no translation. They bang their heads against their cages, they bite the metal bars till their mouths bleed, they hurt themselves trying to find a way out, they moan their pain and despair, they go insane. Animals awaiting slaughter cry out loud, pant frantically, shake uncontrollably, lose control of their bowels, collapse into their own vomit, try to scale walls in their desperate attempts to escape. Some try to protect their young with their own bodies. All are intelligent, sensitive, social individuals with minds and lives of their own. They raise families, they build nests, they nurture and defend their loved ones, they play, they quarrel, they hold grudges, they play pranks, they invent games, they solve problems, they use tools, they seek to understand the world around them, they seek to learn from others, and to teach what they know, they form intense bonds and relationships, they fall in love, they grieve, they laugh, they cry, they hope and fear, they remember the past and anticipate the future, they form communities with distinct social hierarchies, rules of conduct, expectations, rewards and corrections. They sing. They trust. They dream vividly. the lives of animals ignore and discount their suffering. Our materials may be duplicated and distributed freely but they may NOT be altered or modified in any way, nor may they be used without attribution and/or a link to the original source.